As usual on such occasions we thought you might be interested in seeing a quick hands-on video garnished with our first impressions of the smartphone. 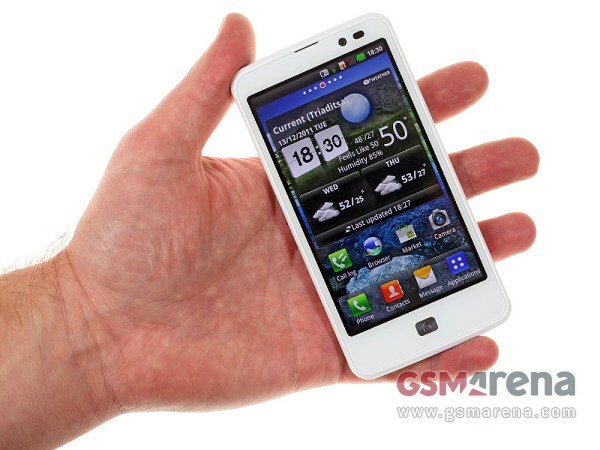 The LG Optimus LTE’s HD AH-IPS screen is downright impressive, easily ranking among the best LCD units on the market. With a pixel density of 326 ppi, you won’t be able to spot individual pixels no matter how hard you try or how closely you look. And granted it cannot match the AMOLEDs for contrast, but it is certainly doing well in its own field. Viewing angles are splendid as well, giving the icons-painted-on-top-of-the-glass look that we love so much. Sadly, the high resolution also seems to have a bit of a negative impact on the performance and the LG Optimus LTE isn’t as smooth as the other smartphones with a similar chipset. Then again, it might all turn out to be a matter of optimization and things might look better with an upcoming update. The Adreno 220 is not the most powerful GPU around, but it should certainly be able to handle the UI better. Cutting to the chase, here’s the LG Optimus LTE unboxing and hands-on video. Don’t worry, the signal strength is fine – the antenna that you saw is used for T-DMB wireless broadcast, as what you see here is a Korea-only model. That’s why we are not going to do a full review of the LG Optimus LTE – this one is not supposed to be used anywhere else. We are going to use it for a display shootout with the Samsung Galaxy Nexus, though, and see if the AH-IPS screen is all that LG makes it to be. If you are still interested in finding more about the Optimus LTE, you can check out our LG Nitro HD review, as that is simply the AT&T version of the same smartphone.